Thanks so much for stopping by for the first day of my BIG giveaway! I am BEYOND BLESSED to work with some amazing companies who have offered up some of their awesome products. Not all of the giveaways are necessarily sponsored by the companies (meaning, some of the stuff I had at the house and wanted to spread the wealth), but even so, they are all companies I love and want to spread the word about. Just a word of warning: Make sure to stop back daily as I will be having a new giveaway every day for the next ELEVEN days and would hate for you to miss out on any of them. Also, some of the entries are available daily (ie tweeting about the specific giveaway, pinning a picture on Pinterest, etc), so if it is an item you are super stoked on, I’d recommend entering as many times as possible. 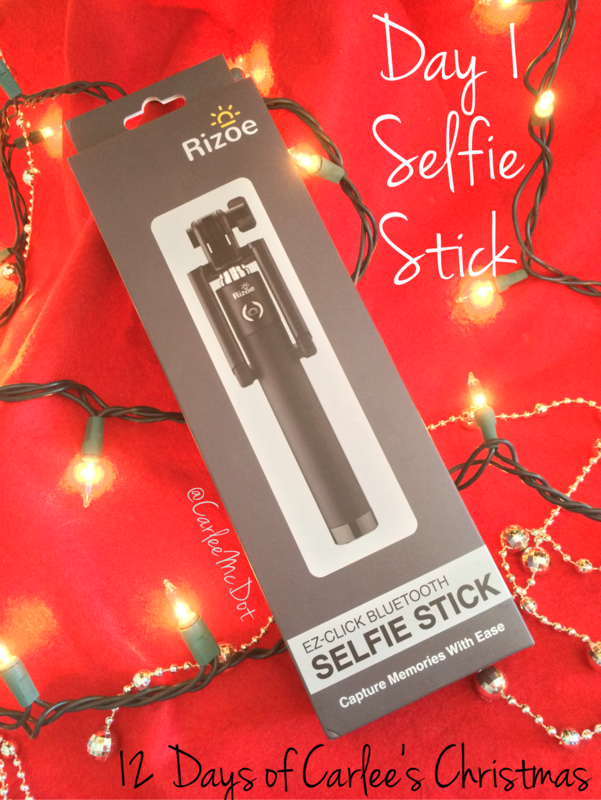 I received this selfie stick when I attended the SHAPE Blogger Meet & Tweet a few weeks back. Since I already have one I thought I’d share it with YOU. It’s a super nice one in that it you don't have to deal with any cords or cables because it easily pairs via your phone's bluetooth. Once it's linked, just use the button on the handle to take all the pictures you want. As with all of these giveaways, they will run for seven days. The winner will be selected on the eighth day. This one will run through December 7th at 11:59pm. The giveaway is open to US residents only. The winner will be contacted via the email address associated with their Rafflecopter account and will have 24 hours to claim their prize. All entries are verified, so please be sure to complete them or a new, random winner will be selected. Enter early and often; some of the options can be done DAILY! Best of luck to everyone who enters! Pro selfie stick, how else can you take awesome pictures when you are by yourself? The answer to the running selfie struggle! 100% pro selfie stick! It makes photo taking so much easier and fun, especially on the run! I am pro selfie stick but haven't had or used one. I'm definitely intrigued by the selfie stick! Makes for great pictures too! I would love to try a selfie stick. I think this would be so awesome for runs and like you said hikes and camping with the hubby and dogs. Is it crazy that I don't own a selfie stick?! I'm going to say PRO, b/c I've never had one before, so I definitely would like to try one out! It is a struggle but I think pro - except while running. Ain't nobody got time for that! I was anti-selfie stick up until I used one at a bachelorette party. Now I see the benefits! Not sure since I've never taken a selfie. I *was* anti-selfie stick...but then my daughter started asking for one...and I started thinking more positively about it! I was also anti selfie stick! Coming around to the idea though. Still undecided on these! I really want to try one! I am totally PRO selfie stick...we have captured some great "family" pictures by using our friend's. Would love to have our own. I always thought they seemed a bit much, however, after seeing how much more a person can capture in the photo, I'd give it a try. You take good shots, so maybe that is one of your tricks! Pro selfie stick! They're fun! I so need this! My teenage daughter has banned me from taking group selfies since I am the worst at them & my arms are too short! Thank you for sharing, Carlee! I used to be anti-selfie stick, but they are so darn handy! I am of no opinion. They could be good, but I just haven't used one yet! I used to be anti-selfie stick, but one of my friends has one and we always have so much fun taking group photos! Used to be anti selfie stick but as a runner I want one now lol! I've never used one, but I can see how they'd be handy when you're out in the great outdoors. I hate when I see them in crowded public spaces though. This would definitely help for better background shots! I'm more neutral selfie stick. I'm not big on them in sometimes, but they definitely have their useful purpose. They can be annoying when people dont think, but that can go for anything. They are definitely nice to get shots not so close up. I've never tried one, but I bet my daughters would love it! I am Pro Selfie stick, I think they are great when your travelling by your self, out with friends, and are great for group photos when you have arms that aren't long enough to take a selfie! Definently love them! I'm pro selfie stick; anti people who use them inconsiderately. I've never used a selfie stick but it seems like a good idea. I would like to try it. my step daughter loves selfie sticks! I guess I am pro. I haven't tried one yet, but it looks neat. I've never used one, but I'm pro because I have short arms. I think they can be fun...I have never used one before. I'm not exactly a pro but i'm not anti for sure! I have never used a selfie stick. Would love to start! I would love to have one of my own to step up my memory making game. Pro and I have it on my christmas list! I don't mind them, as long as they don't interfere with someone else's "experience." We visited Yellowstone this summer, and people had them out blocking other people. That was kinda intrusive. I've never used one but would love to try. I will say some people get extremely annoying with them. Pro, duh!! Thanks for the giveaway!